A tired looking Murrayfield Racers failed in their bid for a clean sweep of all Scottish National League trophies, and tasted their first defeat of the season after being well beaten 5-0 by Paisley Pirates in the play-off final at Dundee Ice Arena tonight. The league champions looked out of sorts from the off and missed the speed and physical play of the suspended Callum Boyd, after the dynamic forward, who scored twice in Saturday’s 4-3 semi-final win over Dundee Comets, also picked up a one-game ban. Pirates took a 2-0 lead into the first period break, both goals coming on the power-play from former Elite League ace Adam Walker, and defenceman Martyn Guy. 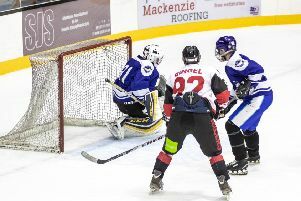 Racers struggled to create quality scoring chances on Paisley net-minder Graeme Meechan, who rarely looked troubled in his man-of-the-match performance and Pirates took advantage of a poor line-change in the 24th minute to extend their lead. Tired Racers forwards went to the bench despite Pirates having possession of the puck in an attacking position, which allowed unmarked former Murrayfield forward Daniel Abercrombie to score from the slot. Racers conceded a sloppy goal less than 30 seconds into the third period, failing to clear the puck out of the zone after an initial Pirates break-away looked to have come to nothing, with Walker on hand to score his second of the game. With Racers defenceman Rihards Grigors in the penalty box, Paisley captain Chris Turley completed the scoring less than a minute later, tipping the puck beyond Racers goalie Mark McGill. Dissapointed Racers head-coach Tony Hand said: “We can have no complaints about that, Paisley played really well and we have to give them credit. “I think as a team over the last three or four weeks we’ve lost our edge, but we had been unbeaten (in all SNL competitions) for seven months and that is something we should all be proud of, and we still have two cup finals to look forward to.